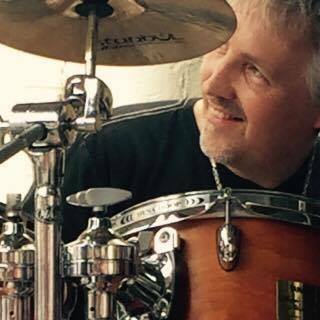 It’s fair to say that part of my passion for drumming is around the equipment I use and a lot of my work is with Tribute Bands. When you’re trying to recreate a sound and look from years gone by, it is often quite a challenge. Looking at it from a drummer’s point of view, drum hardware and shell construction have improved immensely in last 20 years. This is why all my kits in the last 10 years have been modern, road-durable models from mostly well known manufacturers. However, my recent alliance here with The Book of Genesis has led me to re-evaluate what equipment to use and to consider trying to be a little more faithful to the era we are representing. However, this presents some significant challenges….. In the late 70’s Phil Collins (& Chester Thompson) used single headed “Concert toms” – these drums are part of his sound, as he was one of the few drummers using this type of drum beyond the 80’s. The sound was very much out of fashion after that, and most drummers from the 80’s to the present day use double headed toms. It’s fair to say the “Collins sound” is created firstly with concert toms which give an aggressive sound and short decay, secondly by Phil’s hard hitting style and finally (in his solo work and later Genesis material) with a few studio tricks like gated reverb, which was an innovation pretty much invented by accident, by Phil and Hugh Padgham. When I first starting looking into the equipment used by Phil in the early 70’s, I realised the Gretsch kit he relied upon for several years (up to about 1976) was very similar to a vintage kit I owned about 10 years ago. Mine was a 60’s Gretsch Round Badge Tangerine Sparkle model, (Phil’s was a 70’s “stop sign” badge kit in white) which I had imported from the U.S. during a time when I was playing Jazz. The worst memory I have of this particular kit, was it “walking” across the stage during a set at the Marlborough Jazz Festival! This was mainly due to the weak and flimsy “spurs” on the bass drum, which are effectively the legs on which it stands. 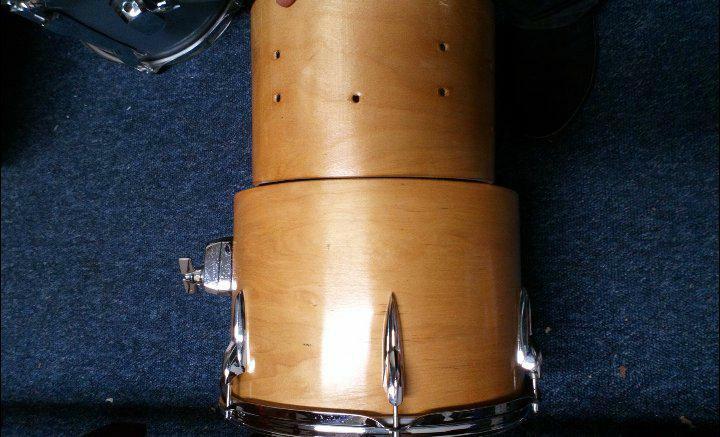 This embarrassing experience was the main reason I sold this kit and another vintage kit (a Red Sparkle 60’s Ludwig) which was suffering from separation of the wood plies on the shells. The truth is that 60’s (and a lot of 70’s) drum hardware is just not up to the demands of a modern drummer. Add to this, the fact that in The Book of Genesis we cover quite a range of material from early Gabriel days to “Three Sides Live”. Therefore a four piece Gretsch kit would not give me enough drums for the flamboyant later Collins fills from pieces like the 1981 Cage Medley. I needed something able to cope with all of the material in the current set. Phil at that time was playing drums by Premier, a British Company based in Leicester with a rich history of producing world-class percussion instruments for rock, jazz, orchestral and military environments. 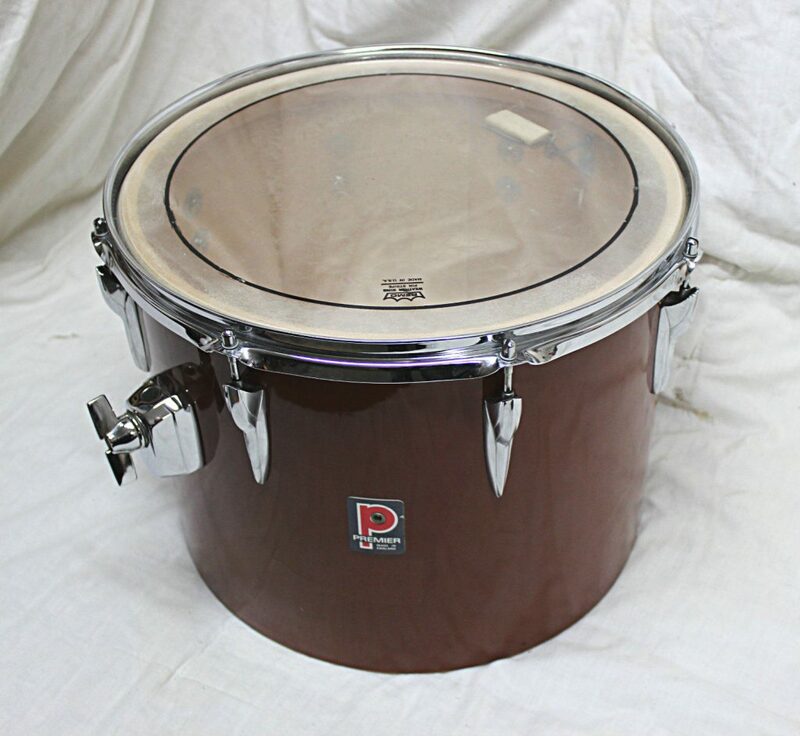 I also have a history with Premier drums, having owned four Premier drum kits in the past and my first ever drum was a Premier Olympic snare drum back in 1974. Premier’s 70’s hardware was well known for being the strongest and sturdiest on the market at that time, so I was less concerned about their drums being up to the job, for that reason. Having decided on what brand to use, I now started the process of trawling eBay and all the Vintage drum shops in the UK to find a suitable Premier kit. In the 70’s, Concert Toms were everywhere, they were truly a very popular innovation with drummers and sound engineers alike. Easy to mic up, they were a live favourite. However, fast forward to today and pretty much 100% of drums are double headed and concert toms are out of fashion with most drummers. It’s also true to say that with the shortage of vintage drums, many single headed toms have been converted to their double headed equivalent, removing more concert toms from the market. 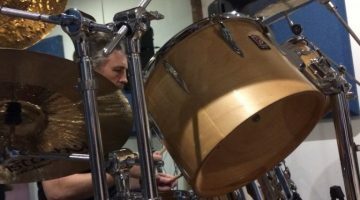 I’d decided that the kit I wanted to emulate was a natural wood finish Premier, which Phil used around 1978-79 and pictured at the top of this article. He originally used a full range of eight concert toms, which he eventually reduced down to six, being the classic Collins “four up, two down” setup we are most familiar with today. With a concentrated search, and having a relatively decent knowledge of Premier drums, I got very lucky in a remarkably short time. 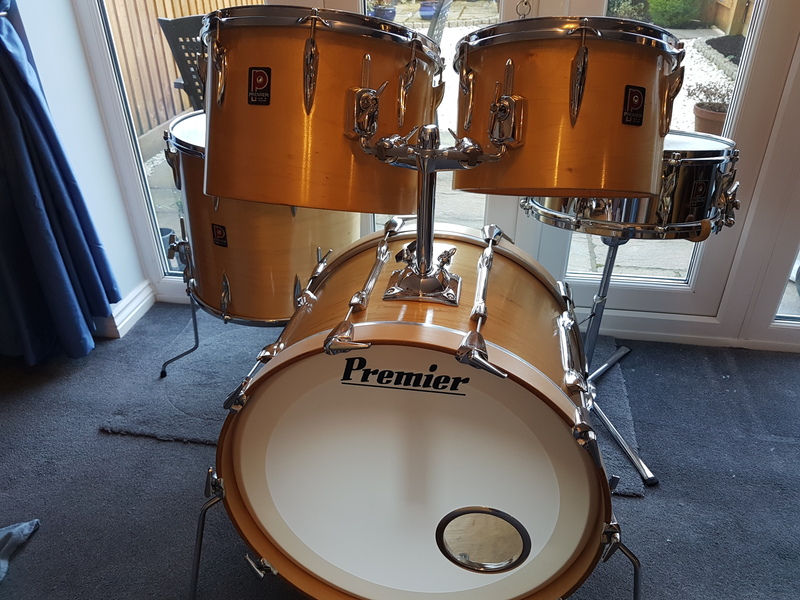 I found an eBay trader who had inherited a late 70’s Premier kit from a retired drummer. It required quite a few spare parts, and a fair bit of renovation, but seemed to be reasonable value for money based on its close resemblance to what I was looking for. 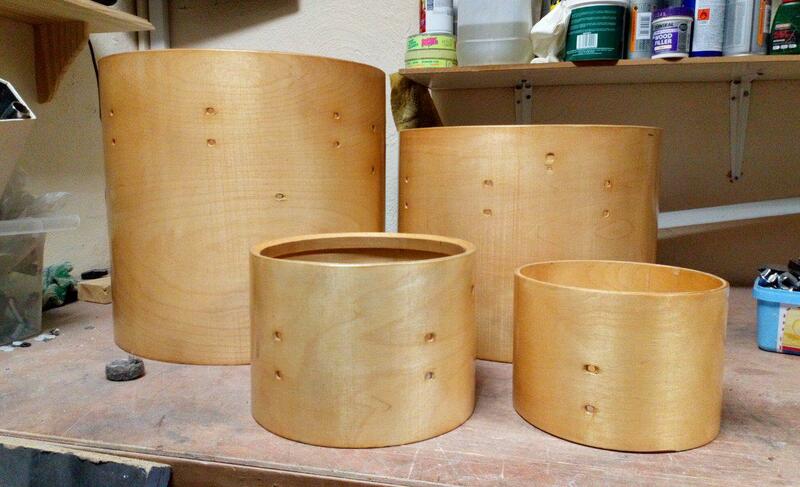 The kit itself would be short on drums for the ideal configuration, but was the right finish (natural birch) and could be added to relatively easily. There was no snare drum included, but the bass drum was a 22” (slightly larger than Phil’s 20” drum) and (then) there were three concert toms – 12”, 13” & 14” plus a 16” floor tom. On closer examination, all is not as it seemed...! On first look, the kit seemed OK but on closer inspection there appeared to be quite a few parts missing and some of the shells were mouldy on the inside. 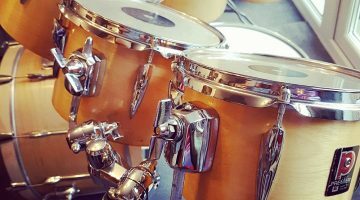 These drums also seemed to be in need of a very good clean and some of the chrome work looked to need replacing due to excessive tarnish. This was indicative of a kit which may have been kept in either a garage or a shed (unfortunately). However, I was up for the challenge and wanted to give this kit a chance of doing what it was designed for once again. I then set about the task of sourcing the extra drums I needed. This is a thankless and time consuming job, becoming more and more difficult due to the lack of old drums available and the number of nostalgic souls like me searching for that lost part (or drum) from their former life! The most elusive and necessary drums the kit needed were the 8” and 10” smaller concert toms which form a big part of the Collins sound. 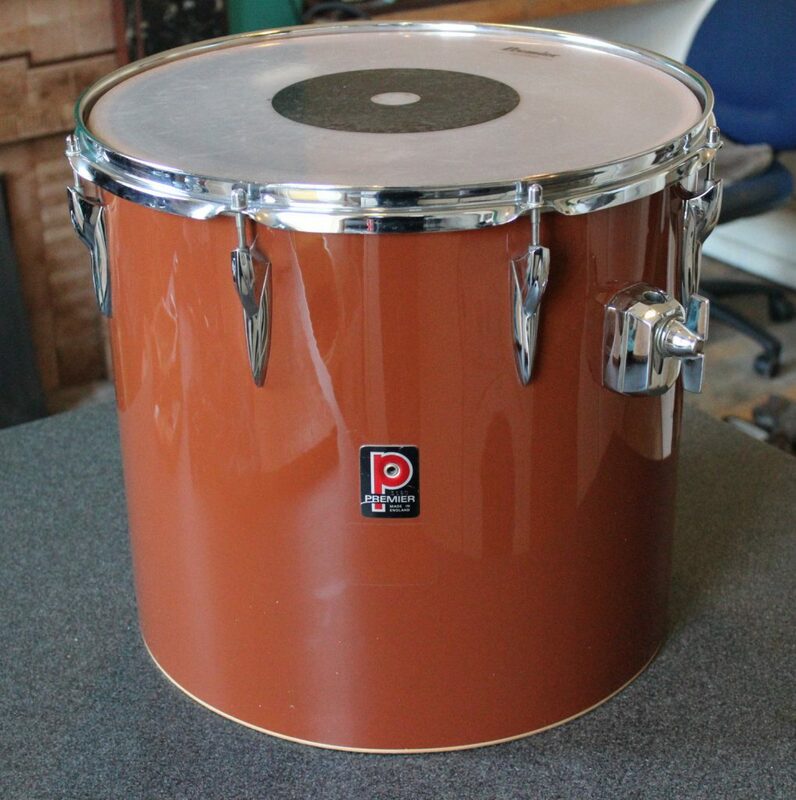 A similar 8” drum turned up via the Premier Drums & Percussion Facebook page, which has been an invaluable source of spares and advice for this kit. The smallest drum was wrapped in a blue plastic covering, but the wood shade underneath was correct, so would just require stripping back and refinishing. However, this drum is something of a compromise as the “lugs” (the metalwork attached to the shell for tensioning the drum) are of the wrong type. This is a dilemma, as to fit the right style lugs would require drilling more holes in an otherwise unmarked vintage drum. I opted to leave it as is for the time being, with a view to sourcing the exact right drum eventually. 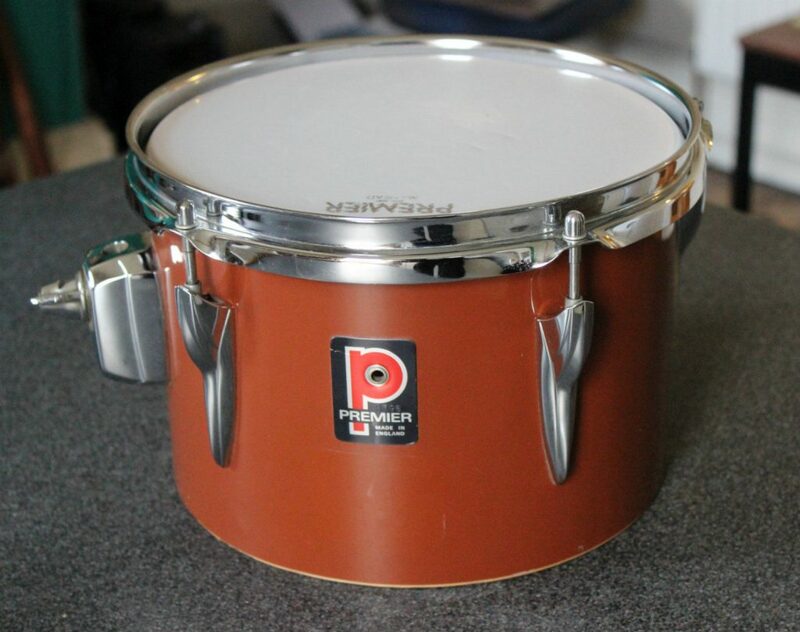 The 10” drum was more difficult to find, but one did turn up on eBay in a red 70’s wrap, featuring the right lugs and wood shade under the plastic. Both of these drums are currently with my local specialist Vintage Drum shop in Radstock, Somerset – Drum Attic. 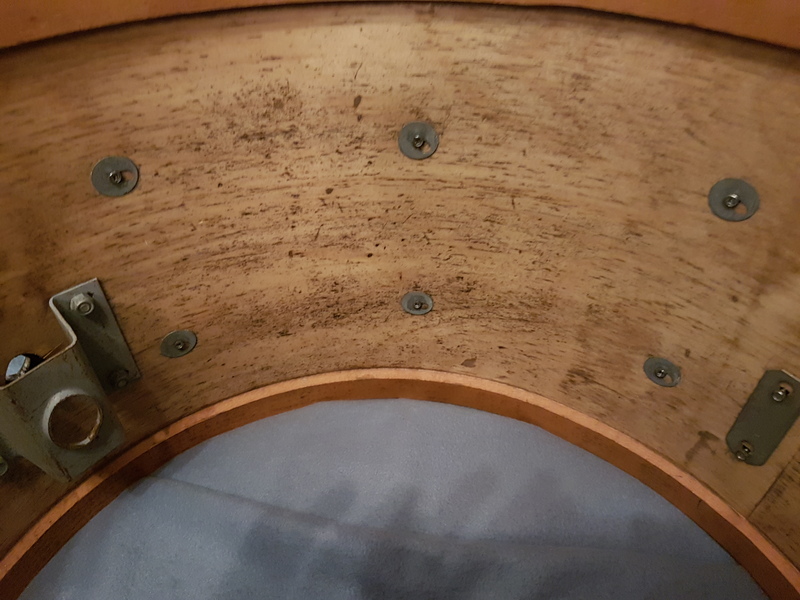 Tristan Head is the owner and very talented restorer of all things vintage in the drum world and he is tasked with removing the old plastic wrap from these shells, cleaning off any glue and sanding them down to a nice smooth finish. They will then be lacquered inside and out, whilst the bearing edges (where the drum skin meets the shell) will be re-cut, ensuring top sound quality from these great old drums. The latest additions to the kit are 15” & 16” concert toms in the same finish as the 10”, which also need to be stripped back to the wood and refinished. Basic four piece kit following restoration (22″ bass, 12″, 14″ Concert Toms, 16″ Floor Tom) pictured with 60’s Premier Royal Ace Snare Drum. 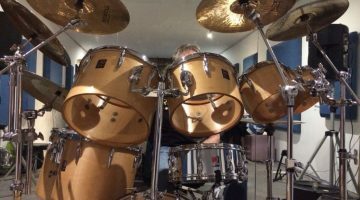 There is still a lot of work to be done by myself on the main part of the kit, and by Tristan at Drum Attic on the add-on drums in order to get everything ready for the next gig in February. 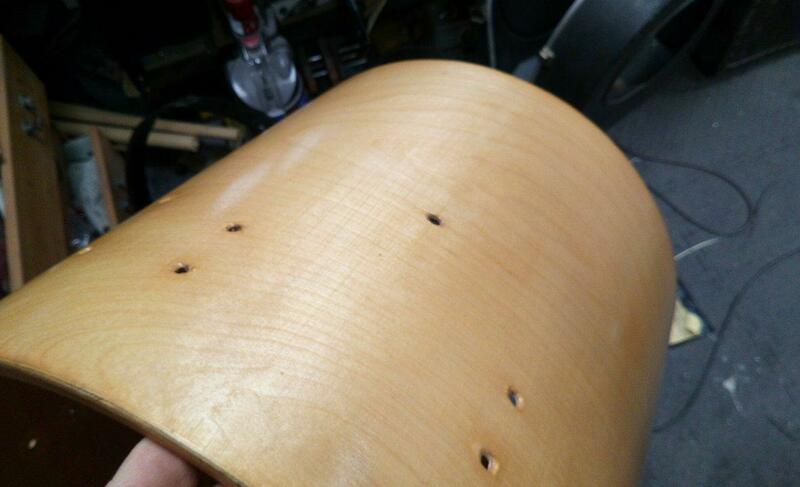 I’ve also just found some Premier birch wood hoops for the bass drum, another missing part very much needed. Along the way, I have bought other odd drums to get the ones I needed, as these things often come in pairs or sets. 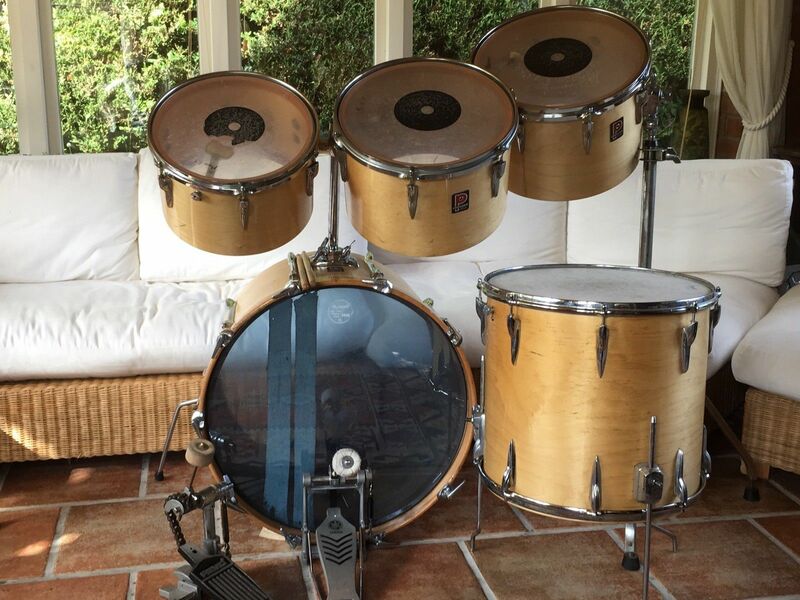 So, the next project will be to use these in a replica kit of the one used by Phil Collins on the Duke tour in 1981. This was a Premier double headed “Soundwave” kit, and I currently have the makings of that configuration in spare drums. Watch this space, as there will be more to add as the first kit is completed and we start work on the second one! 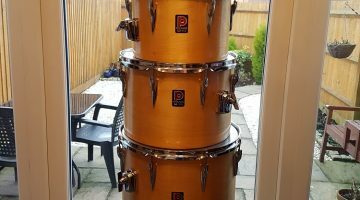 Super blog, keep it up, I am a friend of Graham Collins, owner of the Pearl 4 up two down from 1982, we are very up our Phil era kits so to see this, well it certainly warms my heart! Its really a nice and helpful piece of info. I am glad that you shared this useful information with us. Please keep us informed like this. Thanks for sharing. Hi Russ, interesting article and a great project! I must admit however, that I was surprised regarding your comment of “Premier hardware being the strongest at that time”. I found the hardware of the Premier 202/303 kits very inadadequate. They had horizontal bars to the toms which, even after using pliers to tighten, would allow the tom to rotate round during playing. Flat base cymbal stands falling over could also be a problem. I ditched Premier straight away once Pearl started to make their mark. I wonder if that was a factor in Phils original choice of concert toms at that point because the fittings seem more like modern day Premier with an upright peg. I was friends with a Genesis roadie during the 70’s and he told me that the hardware was especially made for Phil by Premier. A fact I reminded Phil of at the London showing of “come rain or shine” when Phil stated that he still uses the same Premier hardware today and has to have the replacement parts specially made because they are so old. I’m glad to say that I have returned to Premier drums now since 2003 but still use Pearl hardware!